Remember Wheels, those cheese-flavored snack crackers that General Mills used to make? Possibly not. They were launched in Canada in the mid-1960s and never really broke into the American market. An American version of Wheels was introduced under the name Daisies, but you’re not likely to find those in any supermarkets anymore. Wheels have vanished from Canada, too. You probably don’t remember the TV commercial for Wheels (or for its sister products called Flutes and Crowns), since it’s uncommon to remember TV commercials from fifty years ago, especially ones that never aired. General Mills had an ad campaign ready, but pulled it for some reason. The history of a now-vanished snack cracker for a foreign market might not be so interesting, but the cast of its commercial is. Introducing Wheels was a TV character making his own debut, then known as Arnold the Munching Monster, and a terrifying monster he was. Arnold and an irresistible plate of Wheels. Brush those teeth if you want to keep them! Lots of actors find themselves doing things that give them little credit, and that might never be seen by the public. But Arnold didn’t let this discourage him. He had a TV spot to add to his reel and moved along. The camera liked him, and he had panache, so he cast about for more work. In early 1969, he made an appearance on the Ed Sullivan Show, having turned from dark blue to green. (It’s hard to notice, since Arnold’s earlier appearance was in black and white, but his original design made him dark blue.) On Ed Sullivan, Arnold encountered one of IBM’s more advanced computing machines, and spends four minutes interacting with it in a manner that was starting to define him as a performer. Arnold meets the IBM machine. Soon they’ll both be Big Blue. Soon after this TV appearance, Arnold got a major cosmetic makeover. His fur went from green to his old dark blue, and he got some dental work done. This dental work removed all of his teeth, making him look less menacing. In all his TV appearances, his name was never mentioned, but his agents were starting to know who he was. 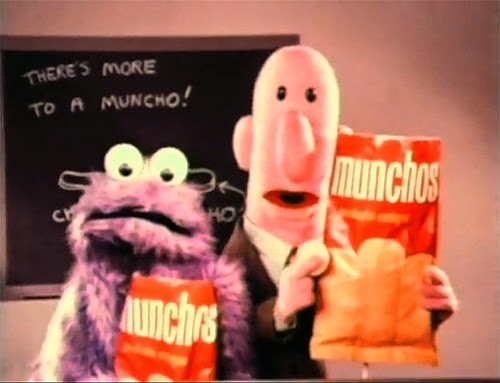 His next appearance was also in 1969, this time for another now-vanished snack food: Munchos from Frito-Lay. Munchos were potato chips, really thick ones, and Arnold’s style conveyed the enthusiasm that Frito-Lay wanted to see. Frito-Lay was pleased with the new ads, and presented Arnold (well, the man behind Arnold) with a contract that gave ownership of all characters appearing in their commercials to Frito-Lay. That was not the direction Arnold and company were interested in heading, and besides, they had another project they were working on. After two Munchos spots, Arnold and Frito-Lay went their separate ways. Arnold for Munchos in 1969, with an unnamed colleague. The toothless Arnold had no problem devouring Munchos. This went on to be something of a trademark, one that endured his cosmetic changes. His voice was provided by the late Jim Henson only once; after that, the remarkable Frank Oz took over and gave him the voice he’s still known for. Arnold’s career took off in November 1969, making his poor impulse control work for him. He abandoned salty snack crackers and found a new love that would define him from that point forward: cookies. Devouring cookies with abandon: nice work if you can get it. The new TV show was Sesame Street, and Arnold’s character finally evolved into the affable Cookie Monster, who became instantly famous for losing all self control at the very sight of a cookie. Like he’d pour bags of Munchos into his mouth and messily devour them for TV commercials, Cookie Monster would grab handfuls of cookies and do the same for public television. Cookie Monster was an instant hit with the young audience he was aimed at. His lack of teeth made him look far less menacing, and his friendly personality reinforced that. To this day, Cookie Monster remains one of Jim Henson’s star Muppets. The Muppets were launched into their place as a cultural phenomenon through work on TV commercials, and settled there by the formation of Sesame Street, which is still on air after 48 years. TV commercials are an ironic place for Sesame Street to start from, since its famous closing line, “Sesame Street was brought to you today by the letters K and R, and the number 7,” suggesting different letters and numbers as sponsors every episode. This was a poke at advertisers, whose products would get plugs at the end of shows they sponsored. One of the stated goals was to make educational programming as popular as beer commercials, since one of the show’s developers noticed that kids would often sing the catchy jingles they heard selling Budweiser or Michelob on TV. By the 1990s, some concerned parents and pedagogues worried that Cookie Monster was setting a poor example by doing on television what many children would probably do if they could. 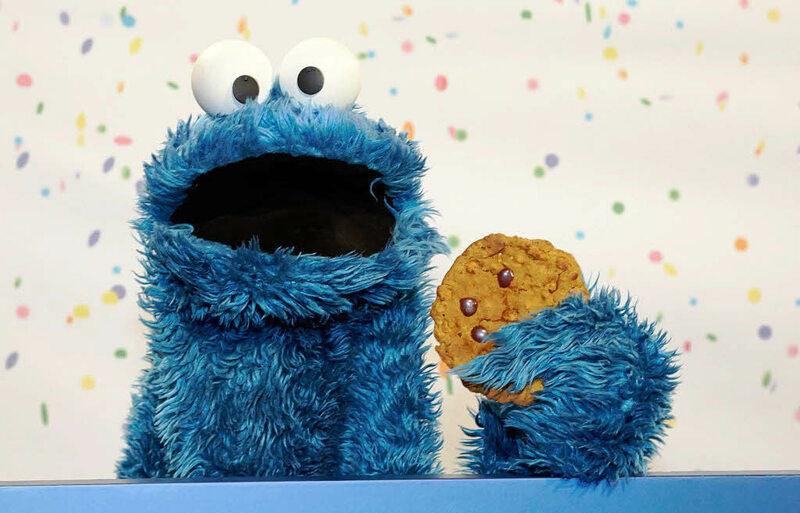 Cookie Monster started to emphasize a balanced diet and worked hard, on-screen, to control his cookie-grabbing impulses. Rumors swirled that he’d changed his name to Veggie Monster, and that he’d lost interest in cookies altogether, leading Sesame Street’s earliest fans, now adults, a little sad at the bowdlerization of this beloved icon. 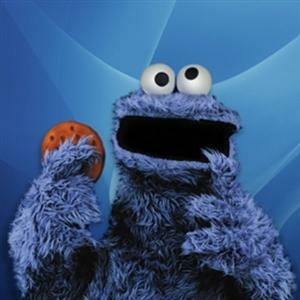 These rumors were never true, however; Cookie Monster still devours cookies with abandon. The part about the balanced diet is still true, but over the past half century, Cookie Monster seems to have forgotten all about salty snack crackers. That’s probably just as well.